Hope you enjoyed the 4th of July holiday. When I think of Independence Day, I think of freedom. We wouldn’t enjoy the freedom we have if it were not for the men and women who have fought and are still fighting to protect us. I had the honor of meeting two of those men at the Bi-State Development Agency’s St. Louis Downtown Airport earlier this week. 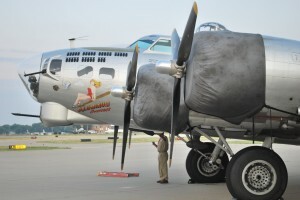 Both men were especially interested in seeing a B-17, World War II era bomber at the airport. 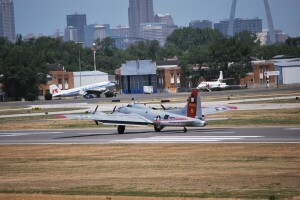 The B-17 flew in the Fair Saint Louis Air Shows on Wednesday as well as in the air show for children and adults with special needs hosted by St. Louis Downtown Airport and Jet Aviation in partnership with Fair Saint Louis. Mr. Young’s daughter, Anne said he never seemed to want to talk about the war. But today, under the wing of Aluminum Forecast, he shared some of his past, including a story about sleeping with bombing plans located nearby, with orders to shoot anyone who tried to take them. 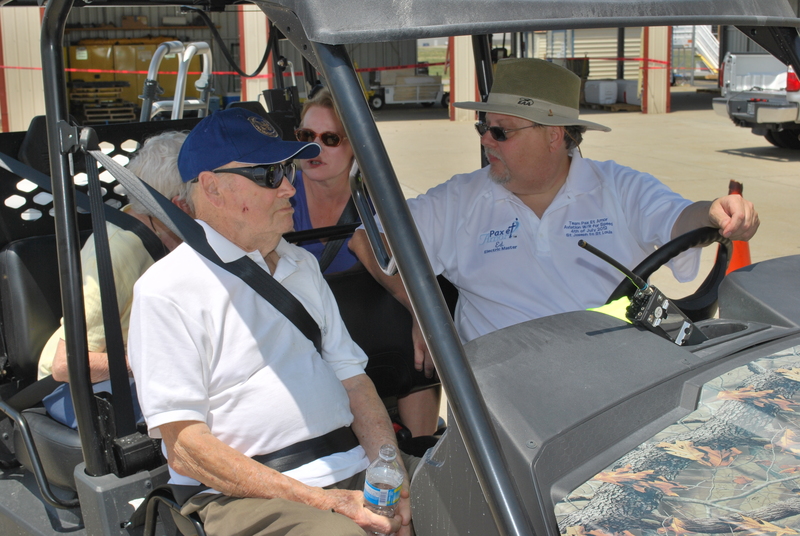 The sweltering heat could not keep Donald Alwine from St. Louis away from the airport or the B-17, and he enjoyed talking about his experiences. He had countless memories about what it was like as a B-17 radio and gunnery instructor. He talked about what it was like to fly in the B-17 and about some of the close calls he experienced. 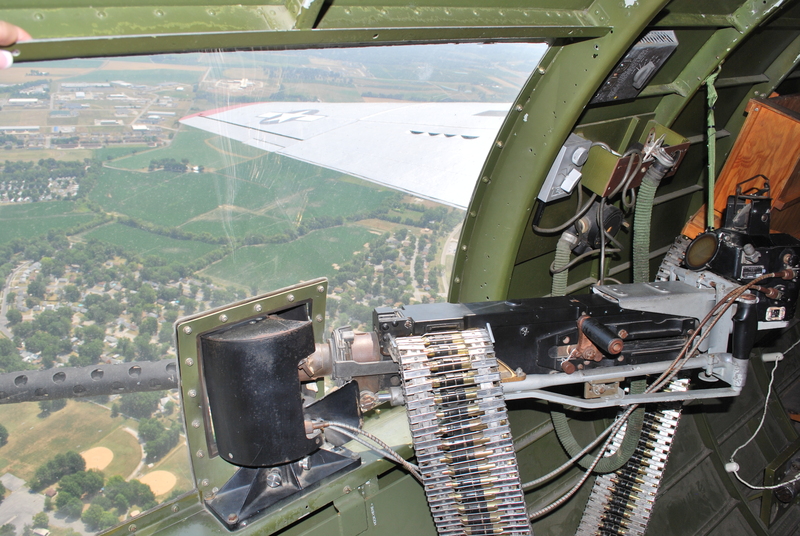 For both war veterans, the fully restored B-17 was a window to their shared past. But Mr. Alwine and Mr. Young were not alone though in their appreciation of this remarkable aircraft. The Flying Fortress garnered a lot of attention during the air shows and when it was parked at the airport. Fans of the plane were experiencing it up close for the first time. Some walked around it in awe, others took tours of the plane, and enjoyed the experience of a lifetime and took a ride on the B-17. 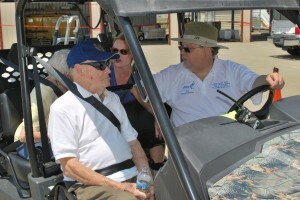 The Experimental Aircraft Association brought the aircraft to St. Louis is now offering tours and rides on the B-17 at Spirit of St. Louis Airport in Chesterfield through July 8. 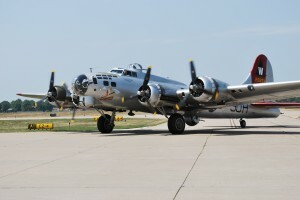 It’s too late to book a flight online but you can get information about the charges for the B-17 tours and the flights. And if you are interested in touring the plane or purchasing a flight, just go to Spirit of St. Louis Airport Saturday morning, July 7 or Sunday morning, July 8. After that, this incredible piece of America’s history and reminder of what so many have sacrificed, will fly away.